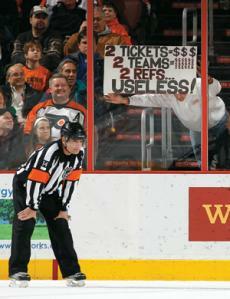 What is it about a hockey rink that can turn a rational individual into a raving lunatic at the drop of a hockey puck? Adults who lead sane and normal lives seem to undergo a “Jekyll and Hyde” transformation that leaves them breathing fire and spitting venom, more often than not in the direction of an official. • What kind of example are you setting for your children or others sitting around you? 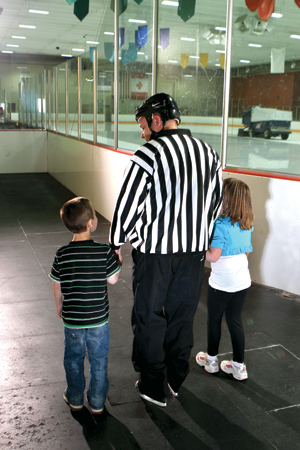 • Has it ever occurred to you that officials may have families in the stands, too? Honest answers to such questions would allow parents to understand how their actions are perceived on both sides of the boards, by players on the ice and other spectators in the stands. “We need to repeatedly bring to the attention of parents that this is only a game,” says Bob Klein, a recipient of USA Hockey’s prestigious Chet Stewart award who has four decades of officiating experience, in addition to 15 years as a coach. Parents, and how they carry themselves, obviously have a big impact on those important memories. It’s no surprise that the majority of abuse raining down from the stands is directed at officials. As evaluation coordinator for the Minnesota Hockey Officials Association, Bruce Carlson has logged enough bleacher time to reach that conclusion. As a 24-year veteran who has officiated multiple world championships, Rick Looker has “been around the block.” He said that parents think they’re yelling at a “striped sweater” and fail to see the person inside of it. “I don’t think they even realize that they may be screaming at a kid who is in his first or second year as an official,” he says. This idea, in and of itself, should be enough to give people pause. In addition they forget that the referee being targeted for abuse has family too, members of which could very well be in attendance. “There were many times I heard people attack my father,” says Paul Stewart, an icon of American officiating who worked 13 NHL seasons, and is now director of hockey officiating for the East Coast Athletic Conference. Stewart’s father, Bill, himself logged 11 NHL seasons as a referee. “It’s hard to alter human nature, which tends to look for a scapegoat when things don’t go well,” says Stewart, who is helping to shield and safeguard today’s young referees (his two sons included) by running a mentoring program in Falmouth and Walpole, Mass. George Nevole learned that the hard way. His 10-year-old daughter was brought to tears by insults, swearing and name-calling hurled her dad’s way as she watched him work a Bantam game in Pueblo, Colo. Sadly, officials find themselves unwitting “whipping boys” when fans are actually more frustrated with other aspects of their hockey experience. “Each of these vocal parents has a story,” Klein says. “Maybe it’s been a tough season for their child or team. Or maybe the game that night is going badly. Or they’ve only won a few games and it’s January. In 23 years of officiating, including 11 as a Div. I official, J.B. Olson has seen and heard it all. “I hear a wide variety of comments when I supervise games, because I’m sitting right there with the fans,” he says. Sporting “an expert’s perspective” from both the bench and the ice, Klein places responsibility on the coach’s shoulders to keep things civil on the bench and on the ice, which will ultimately influence those in the stands. “I would say that the general conduct of the team starts with the head coach,” he says. “I know. I’ve been there. Instead, use the situation as an opportunity for teaching an important life lesson. “The more that parents realize that their son or daughter is learning life lessons, the better off that person and the sport will be,” Looker says.